Sleeping Queens is an exciting and strategic card game themed with colorful royalty themed cards including kings, jesters, knights, sleeping potions, wands and dragons. How to win the game depends on how many players are playing and can accommodate up to 5 players. Game play is fairly quick allowing you to seek revenge in a rematch. Sleeping Queens is a game that is apart from your mainstream card games but will quickly be added to your favorite game list and will easily travel with you to your next party or get-together. Everyone loves to easily learn how to play a fun new card game and this will be sure to fit that bill. Give Sleeping Queens a try today and purchase your own! There are multiple ways in which you can win the card game of Sleeping Queens. You must be the first player to either collect 4-5 queens or receive 40-50 points (depending on how many people are playing) or simply have the most points after all queens have been awakened. 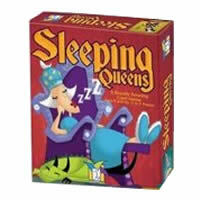 Inside your Sleeping Queens box you'll find a stack of 79 cards and the game rules and instructions. Please keep in mind that the official Sleeping Queens dice-card rules and instructions could be different depending on the game version you have. The rules below are some of the exact directions on how to play Sleeping Queens. Share with us your comments, funny stories, tips, advice, strategies, creative ways to play, questions about how to play, problems with the rules or anything you want about Sleeping Queens. All submissions will be reviewed within 24 hours. Click here to add your Sleeping Queens comments. If you have no queens and only have protection cards (wands and dragons) in hand, what do you do on your turn (since you can't discard either protection card without a knight or sleeping potion to counter)? Can you play more than one king at your turn.